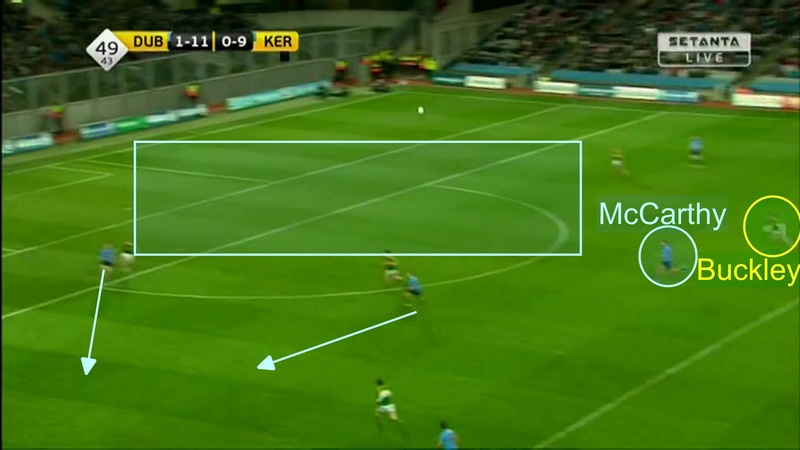 Gaelic Football Viz to help you compare forwards from different era’s. Who has scored them quicker? For an age the talk has been to push up or not on Cluxton’s kickouts. Regardless of what you would like to do, the practicality of doing it is another thing altogether. 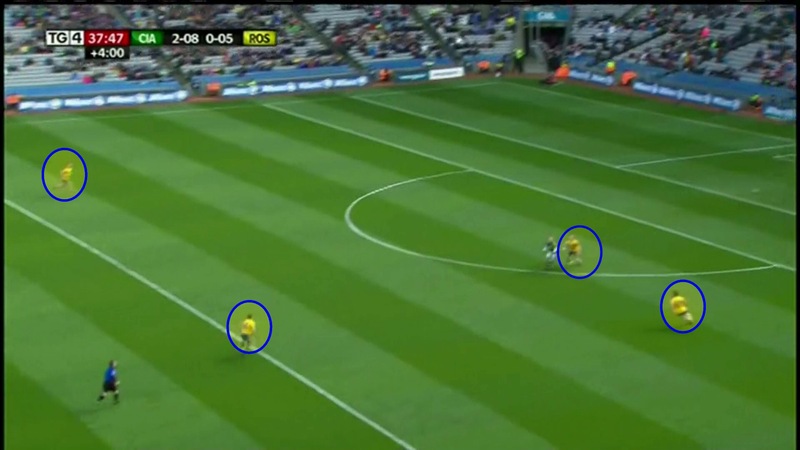 TV angles don’t usually allow you pick up the movement of the outfield players but there was one great example of just how quickly Cluxton and Co switch on for their own Kickout. Kerry take a shot (from open play). So this isn’t an opportunity for either side to plan a move. 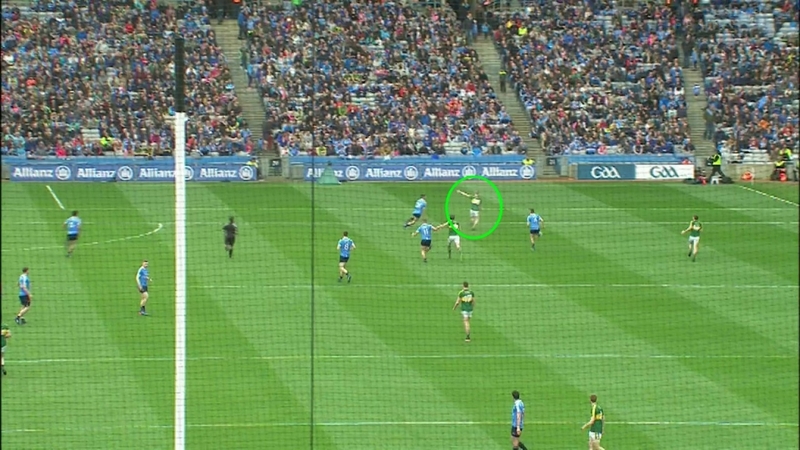 As the ball is still in the air, in fact it’s only barely left the Kerry foot before Cluxton reaches down to get the second ball. 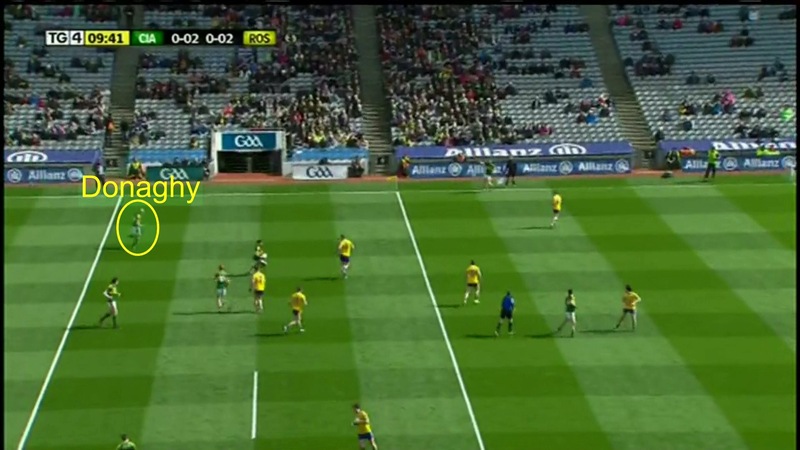 It’s no use of Cluxton is the only one thinking like this. But he’s not. As you can see the ball is still in the air. 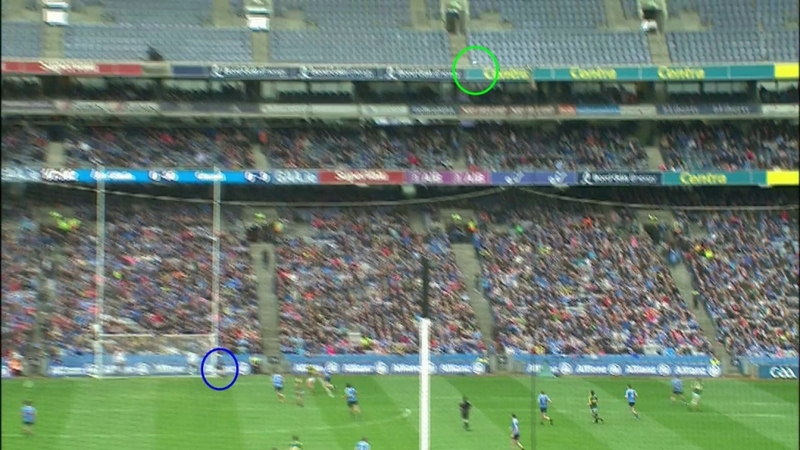 Cluxton comes out with his head up looking for the runs and it’s Ciaran Reddin in this case who has already set-off. 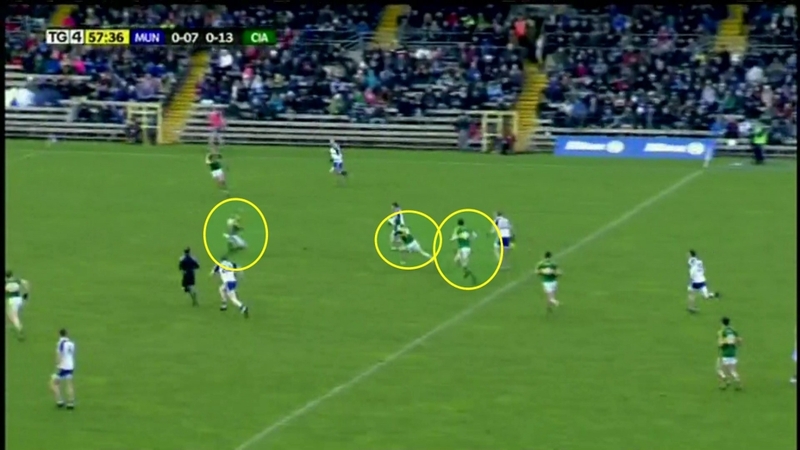 Notice as well that the Dubs are great at getting out of the way to make that pocket of space bigger for the runner. 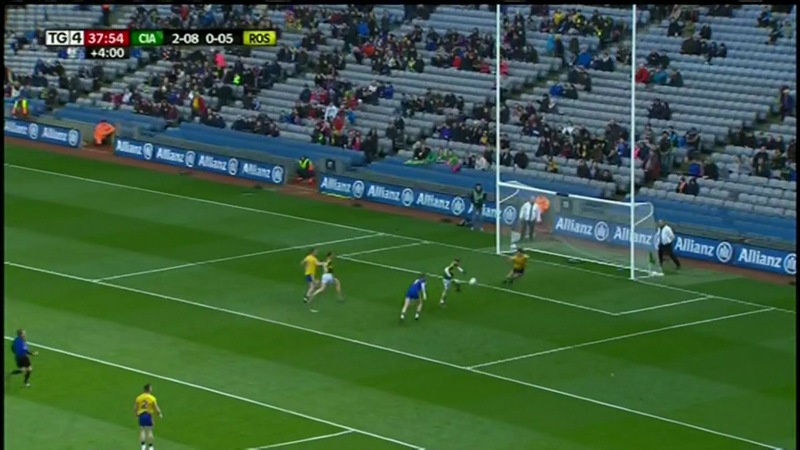 It’s 6 seconds from the ball leaving the Kerry foot until Cluxton kicks the ball out. Even with 10 men in shot, the speed of thought and precision of execution makes it so difficult to compete. Training age is the cumulative amount of time you’ve spent training for a particular sport. It refers to a cumulative workload (and skill level) built over years and years. This of course is not just about time. I’ve been driving for 16 years and I’ve seen very little improvement. You need to be in and around environments that push you, have coaches or mentors that test you constantly to evolve and get better. As a player moves from club to county the premise is that he is now exposed to better coaches, surrounded by better players in training and playing a higher standard of opposition. All of these factors should contribute to a player and team’s development. To bridge the performance gap teams started to put in more hours. Early morning training and extra sessions were a plenty. But there are only so many hours in the day. Counties are finally realising that more does not necessarily equal better. Now there is more emphasis on talent both on the pitch and behind the scenes. This week Andy McEntee highlighted the importance he placed on having his preferred Strength and Conditioning coach as part of, not just his management ticket, but the entire Meath set-up. 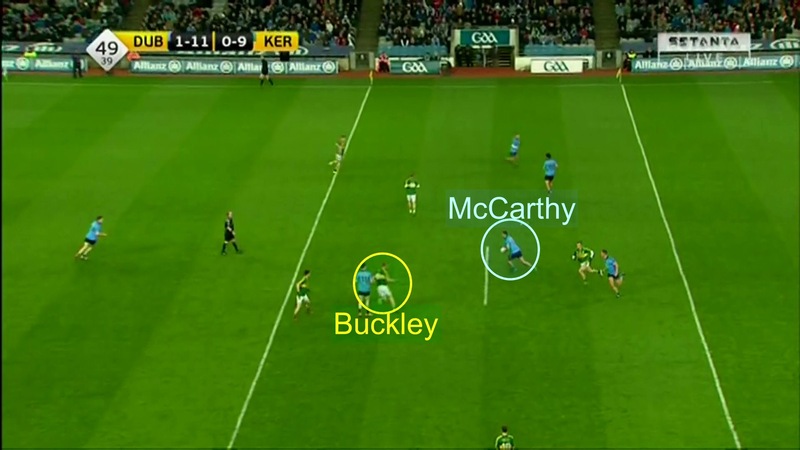 He is now fulfilling a role similar to Bryan Cullen for Dublin or Cathal Cregg for Connacht. You can expect many other counties to follow suit, counties employing expertise to work across an entire system rather than on a nod and a wink from the senior manager. It highlights the importance of getting the right people in behind the scenes. But the nature of the competition structure builds in a constant disadvantage. Successful teams play more games and by extension have longer seasons (under expert supervision). Last season as we mentioned Dublin began their competitive season in January and ended it in October. Wicklow were out by the middle of June. 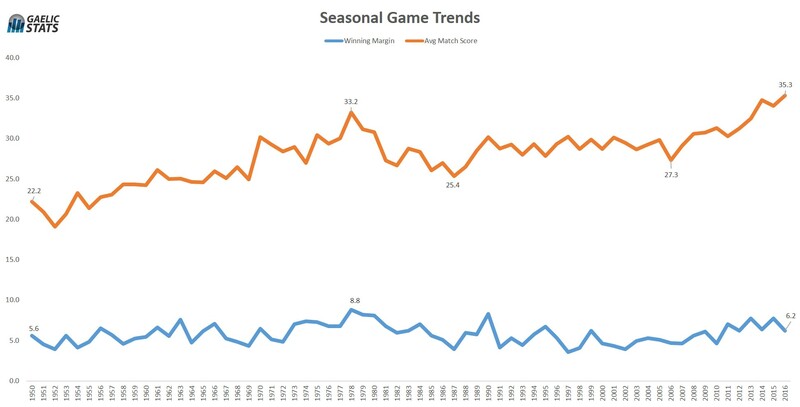 What is startling when you look at the actual figures, the cumulative effect of shorter seasons means there is a built in sense of the inevitable about the inter-county scene. Even if the much maligned county board could stump up to hire all the ologists possible, unless teams start winning and making their season longer it’s hard to see them ever catching the big guys. The table below shows the week each county has finished their season in for the last 10. For example in 2016 Dublin & Mayo finished in week 40 while a team like Down finished a full 14 weeks previously. Taking an average of just 3 training sessions a week that’s at least 42 training sessions. 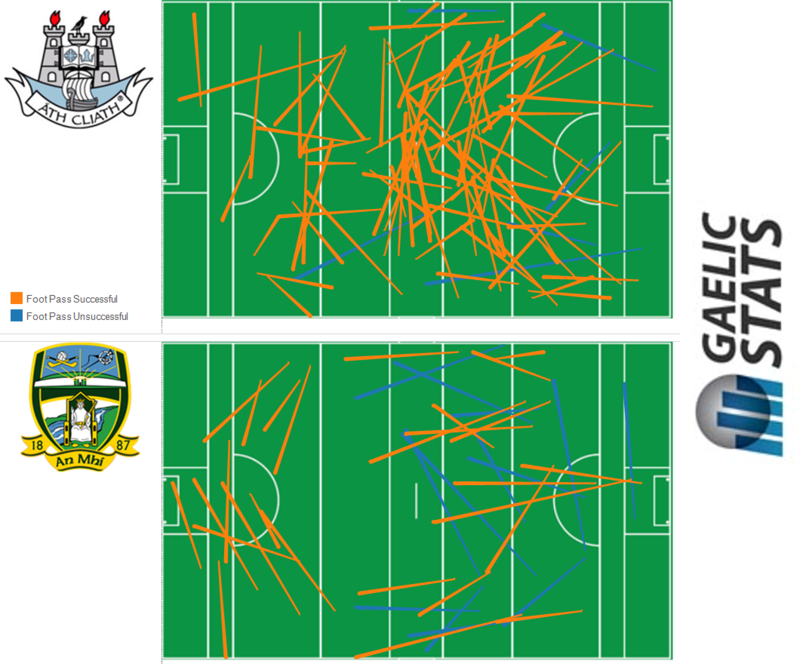 Even if you said the backroom teams of these two counties were of equal quality (and that’s an unrealistic assumption) that’s a lot more expert-led training those Dublin players have over Down. Starting the 2017 season Dublin are at least 42 sessions and 7 games ahead of Down, all other things being equal. 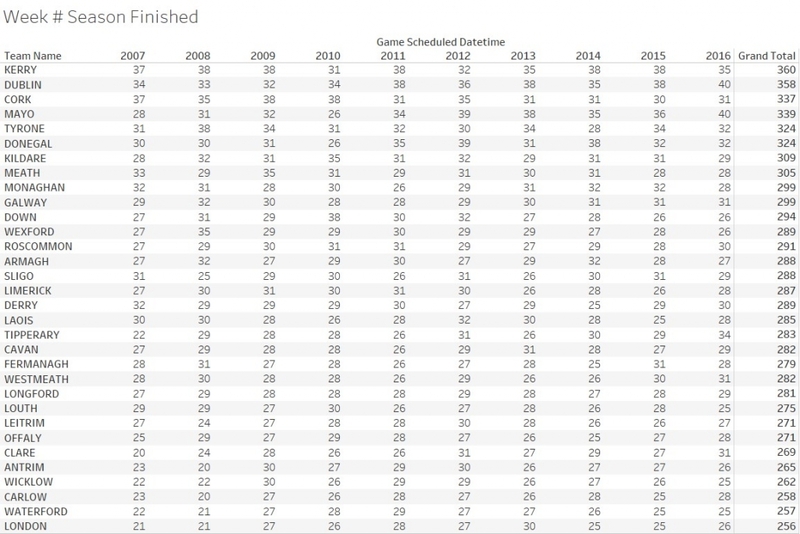 When we add this up over the course of say 10 years we can see that Kerry and Dublin average a season of about 36 weeks while mid-tier teams like Armagh, Kildare & Roscommon have seasons lasting just 29 weeks. 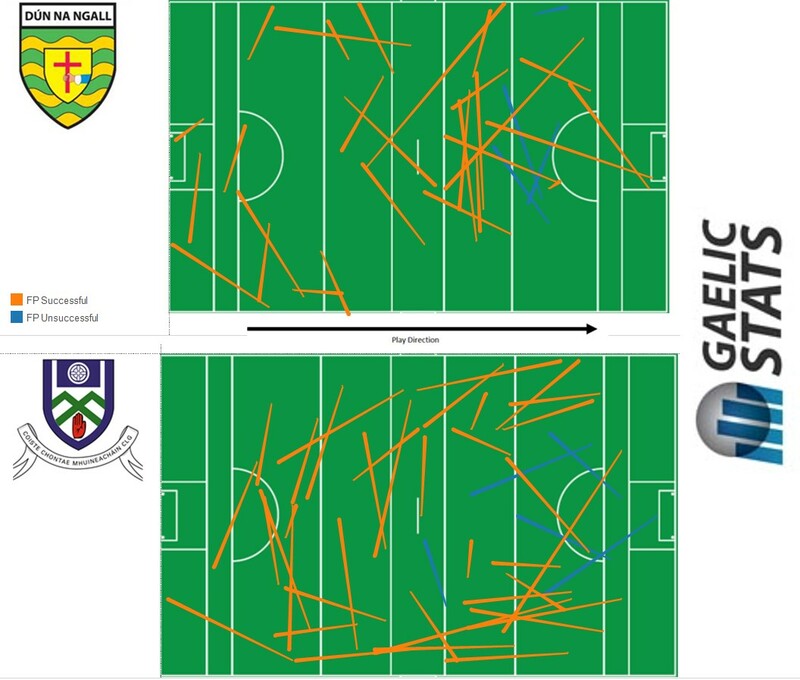 Build in the squad turnover most teams outside of Monaghan, Donegal, Dublin and Kerry have and you can see a huge discrepancy open up between the have’s and have not’s. It’s a self-fulfilling prophecy. Whether winning causes more stable squads or vice-versa the net result is the same. Winning teams have longer seasons, with more stable squads, usually under expert led coaching staff. I had this conversation recently with a manager from a weaker county. There were the usual grievances about receiving a more level playing field in terms of financing but what really transpired was that without extending the season (games and time) his players would file back to the clubs where the structures just aren’t there to keep the development going. I’m no believer that we should create an artificial method to get weaker teams into the semi-finals. Any competition should be about getting the best to play each other but the different season length has a big impact on the ability of the weaker counties to make up the difference, even if the funding is in place. Staying alive in the championship has many upsides (not least you might actual win something) but not to be underestimated is the amount of training time these players receive or more importantly the weaker county players miss out on. Having additional games is vital but if the actual season length allows for such large discrepancies it’s hard to see teams making those giant leaps forward. There has been plenty already written about the merits or otherwise of introducing the Mark. Whether it’s needed or not is not the point of this article. It’s here to stay so what can teams expect and how might they use the new rule to gain an advantage. 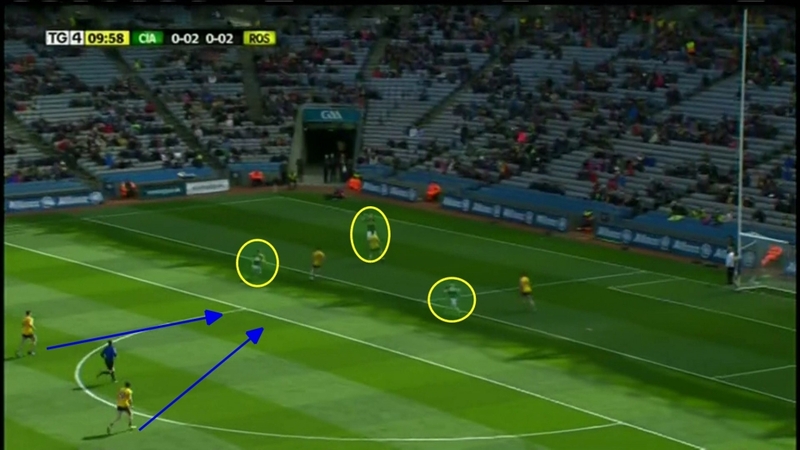 For the team kicking the ball out I think the mark will offer little or no advantage. Maybe in the last few minutes of a game if you want to slow things down, but you only have 5 seconds to kick the ball so you better be quick. Having sat in on a recent rules presentation at the National Coaching Conference in early January I believe the biggest issue with the Mark could be the infringements that happen around it rather than the Mark itself. The Mark is borrowed from the AFL but in AFL the onus is on the player who caught the ball (took the mark) to move back. The point at where the mark is taken is where the defender can stand. They are under no onus to move back. They stand there ground and if the marking player passes that point(allowing for momentum) he is deemed to be playing on and can be tackled. When a Player is awarded a Mark or Free Kick or is Kicking into play after a Behind has been scored, one Player from the opposing Team may stand at the position on the Playing Surface where the Mark or Free Kick was awarded or where the field Umpire otherwise directs the Player to stand. The position on the Playing Surface where the opposing Player stands is known as “the mark”. The Protected Area is a corridor which extends from 5 metres either side of the mark to 5 metres either side of, and a 5-metre radius behind, the Player with the football, as illustrated in Diagram 2. No Player shall enter and remain in the Protected Area unless the field Umpire calls “Play On” or the Player is accompanying or following within 5 metres of their opponent. In the new rule introduced for football the onus is on the defending player (player who didn’t win the mark) to retreat 13m or if the player who made the mark decides to play on to let him take 4 steps (or see (I) below). If not, a free kick is awarded, which can be taken by any player. Because of the proximity to the opposition goal the Mark is much more likely to offer an advantage to the non-kicking team than it is to the kicking team and this secondary foul issue might be the reason. Scenario 1; You take your kickout, it travels past the 45 and a successful mark is taken by the team who kicked the ball out. The player decides not to play on but take the ‘free kick’ option. The rule states he has 5 seconds to kick the ball and as with free kick rules the ball must travel 13m. Failure to take the kick on time will result in a throw up. While failure to kick it the required distance will result in a free to the opposition. It might be the case that not kicking 13 happens very infrequently currently, but players aren’t taking frees with a 5 second time pressure. The decision making of the player who took the mark will need to be sharp and those around him will need to keep their distance. While attacking teams might lose the initial kickout there could be an upside to having pressure on high up the pitch and forcing the foul or forcing the team to aimlessly kick it away. Scenario 2; The attaching team win the Mark. This is the one that I could see causing the most issues and perhaps will result in teams at least exploring the possibility of pushing up on opposition kickouts, even if that’s just for key moments of the game. The same 5 second rule applies to the player taking the mark, So while you have the opportunity to shoot, it’s only the player who catches the ball that can shoot directly from the mark. Considering the time pressure, the likely distance from goal (min 45m) and the chance of your free taker taking the mark I see direct shots as a rare occurrence. Again though I see the secondary fouls, infringements around the Mark, as being the most dangerous and causing the most controversy. These are as likely to happen in wither direction but having the ball moved from your 45 to your 65 doesn’t carry the same importance as having it moved from outside the scoring zone to inside it. 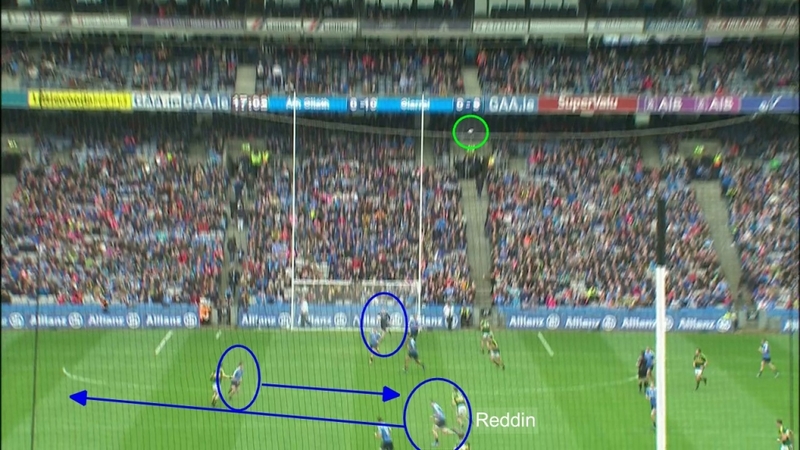 Case 1; Diarmuid Connolly catches the ball and Lee Keegan doesn’t retreat 13m quick enough the ball gets moved forward 13m and can now be given to Dean Rock to take the subsequent free. While the advantage is minimal from taking the mark, it’s much greater if you can ‘win’ a secondary free. Discipline will be important but also referees will have to deal with quick free attempts where the defending player hasn’t retreated or maybe hasn’t had time to. 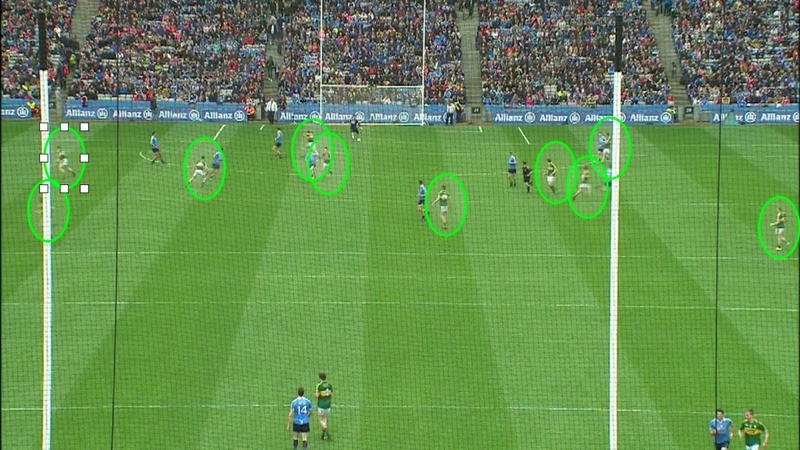 This is where the difference the Mark rule as used in AFL and the new GAA is especially important. 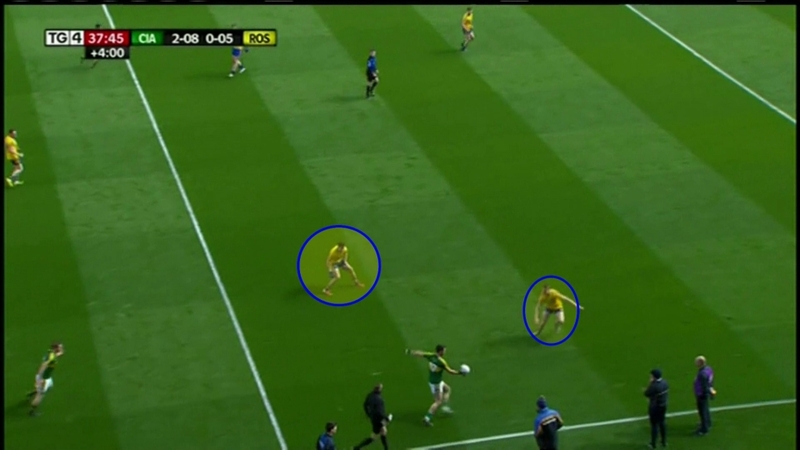 Suppose in our fictional example Connolly catches a mark and decides to play on. Lee Keegan can’t tackle him for 4 steps. In AFL Keegan would be under no obligation to retreat or move out of the way. As long as he holds his position at the point of the mark it’s fair. 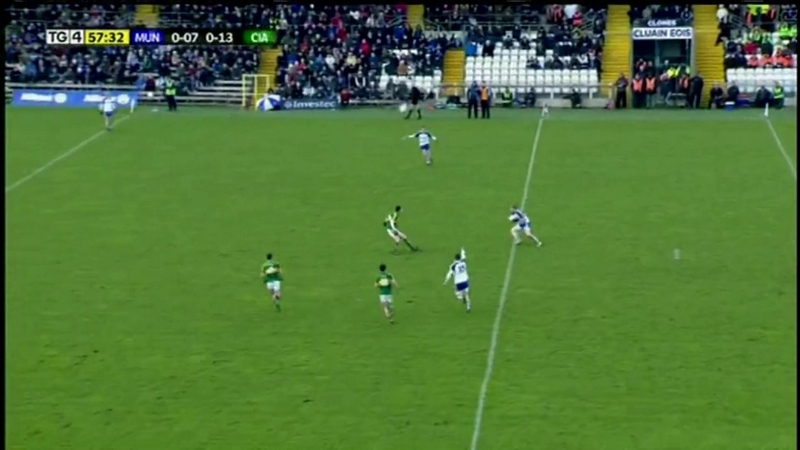 In Football that’s not the case, he can be in close proximity but he can’t tackle Connolly. How disciplined players are around this will be key. Letting any forward take 4 steps towards goal will not come easy to tenacious defenders. Referees interpreting when a ‘tackle’ is made will also be key. Staying close enough but not actually tackling him will require some fine tuning. The chance of winning an opposition long kickout (past the 45m line) is currently 45%. If the non-kicking team feel that the mark offers them an improved advantage, from either an initial mark or forcing secondary frees, maybe we will see teams push up more, less short kickouts and more high fielding. Maybe? The common consensus is that nothing will really change, but no one knows for sure. There are plenty of bright minds in the game who will be doing more than just saying ‘this won’t change a thing’. They’ll be experimenting, planning and watching endless hours of tape. It won’t surprise me at all if somebody has something up their sleeve to exploit this new rule, but it’s also very likely we will have to wait until August before we see it. Check out the form of any county over the previous 35 games. You can use the filter to look at Championship, League or both. There is an Iker Casillas quote that seems to sum up much of the narrative around Gaelic Football at the moment. While there are no doubt some kids around the world who dream like Iker, the majority want to score them. Likewise I imagine there are very few kids who are dreaming of playing in a blanket defence. Sure they will take the county jersey if it comes, but most want to do the scoring not stop it. Fans will talk longer about the great forwards of the game, than the great defenders. The prestigious Ballon d’Or has had only 3 vaguley defensive winners since 1976 and the last true defender to win Footballer of the year was Marc O’Se in 2007. One is a tale of wonderful players, of ingenuity and guile and wizardry, constantly finding new ways to improve on (what at the time looks like) perfection. In soccer there was a time when seven players on any given side were given over to attacking, with two halfbacks and one fullback. That soon morphed into the W-M formation as two attackers were pulled back, and then came the 4-2-4 of Hungary and Brazil, the 4-4-2 so beloved of English managers, and now, the trend is to deploy just one striker. Barcelona and Spain do not even do that, since the rise of what has been called the false nine. Gaelic Football is going through a similar transition. Recency bias will determine that Jim McGuinness is to blame but the reality is of you read Daire Whelan’s The Mangers,a fascinating history of the tactics and thinkers that have transformed Gaelic Football you will see that the game has constantly had innovators, both in attack and defence. 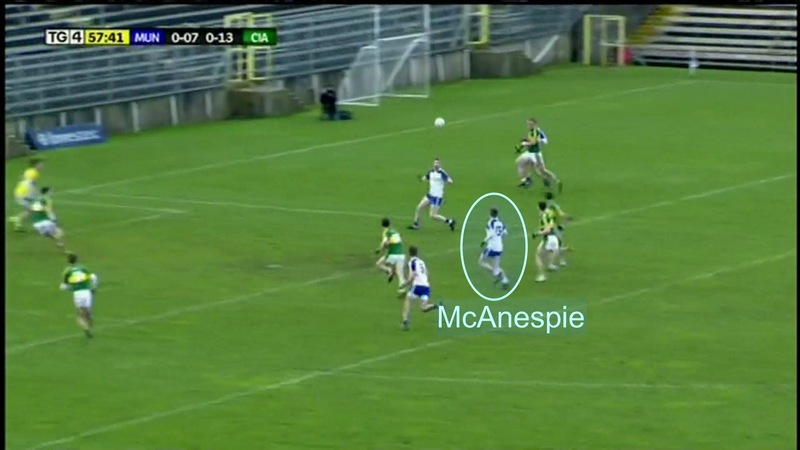 This ‘curse’ of the sweeper did not start or end with Jim McGuinness. Soccer has transformed itself from a game of 7 attackers & 4 defenders to one built more on 11 attackers and 11 defenders. Gaelic Football is attempting something similar. 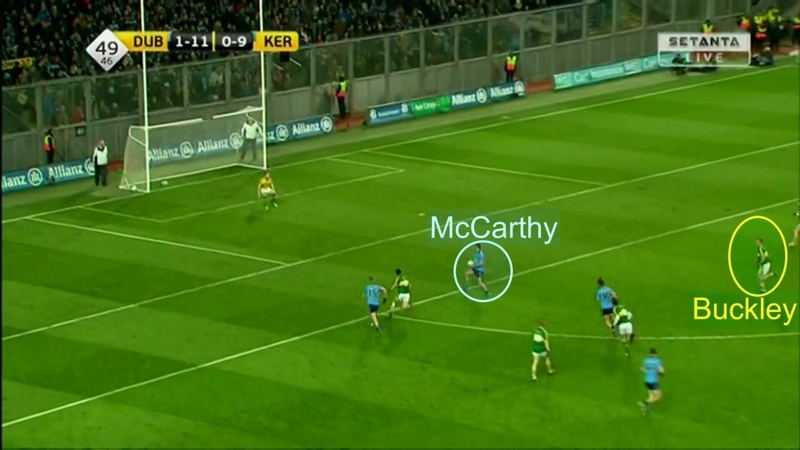 At the later end of the season watch how many people take pictures of 15 Kerry or Dublin players defending in their own half, as if ‘look, even they are doing it’. But soccer is a very different game. Despite all the rule changes, (offside, backpass and 3 points for a win) the goals per game has barely moved since the 70’s. To state the obvious, not conceding guarantees you something in soccer – you can’t be beaten. Therefore it is possible for team in leagues or major competitions to approach games with the ‘we won’t concede’ mentality and that has potential to get them somewhere. In other words soccer allows you put almost all your focus on the stopping part of the game. 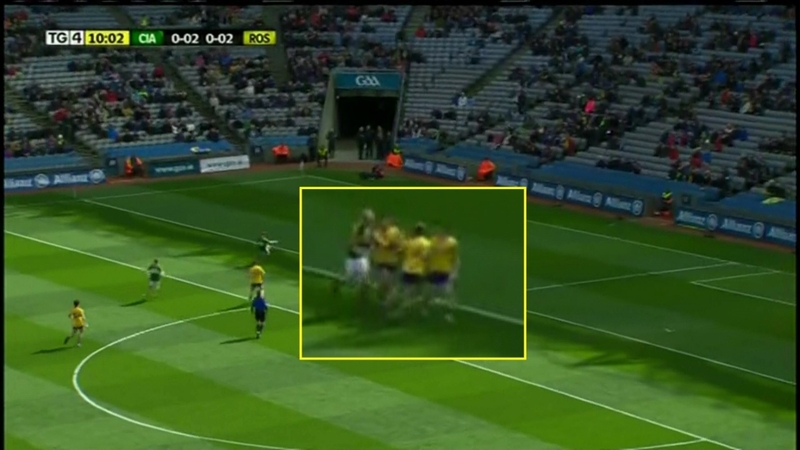 This is virtually impossible in Gaelic Football. You have to go back to the 1940’s to find a scoreless team. While the two sports share a lot more in terms of tactics & strategy than traditionalist would care to admit, this is a fundamental difference. The nature of Goals and Points demands that you have to have a strategy for both stopping and scoring, a fact that seems sadly lost on many teams today. I have reproduced a similar graph as above but for Gaelic Football. It is clear in the soccer image that there was a significant shift in strategy around the 1970’s and despite all the advances in training and preparation, video analysis and coaching standards the new normal began in 1970 and hasn’t be altered since. Here is the scoring chart for Gaelic Football over a similar time frame. Data from 1950 – 2016. Qualifiers have been excluded to allow for like for like comparison. 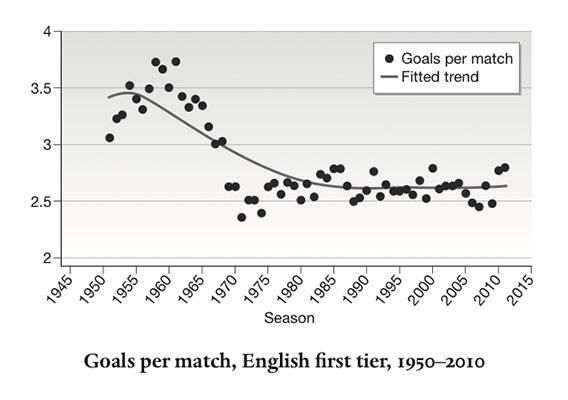 Despite the defensive revolution that McGuinness has apparently blighted the game with; scoring in general is on the rise year-on-year and there is no big dip like in soccer. And for the doubters who say yes the number of points being scored might be the same but that’s because teams like Dublin are doing all the scoring, well the blue line discredits that theory. The average winning margin is almost amazingly consistent since 1950. My point with all this is two-fold. First I feel the facts should get a fair hearing. You may not like the style the game is currently being played in, but don’t confuse that with the substance of what is on the pitch. Defensive football is not leading to less scores! Secondly to the managers and coaches. For all the effort put into defensive systems, for the lack of enjoyment the fans seem to get from this style, for the sake of attracting the exciting, ambitious players, you really need to question what value are you getting from this defensive football? Taken as a whole teams are not conceding less than before, as we can see above scoring is on the increase. Football is not like soccer, you can’t progress by just stopping. I look forward to the next iteration of the game, I hope it goes on the attack.